I'm not much of a jibber, but that only means less competition for the rest of you this weekend. 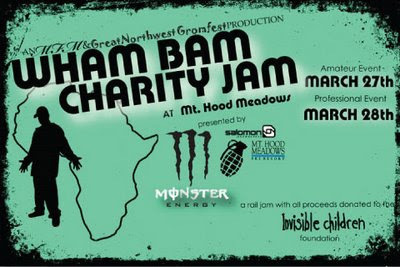 Up at Meadows the Wham Bam Charity Jam (seriously people, is it that hard to think up an original name for an event?) is set to go off on Friday and Saturday. The AM event (as in amateur, not morning) is on Friday (as good a reason as any to skip school) with the top three finishers from a 15 and younger and a 16 and older division getting to compete against Marc Frank Montoya and the pros on Saturday for cash and prizes. Proceeds go to help Invisible Children Inc. a charity dedicated to peace in northern Uganda. Let me guess, you didn't know there was a war going on in northern Uganda. Neither did I. As of the info on their site, it's been going on for 23 years. If you're a jib star and want to help out some people who truly need it, this is your chance. If you just want to know more about Africa's longest running war and help out without fear of reconstructive surgery, check out this page for screenings of their movie near you. If you just want to see some live action on the man-rails show up at Meadows Friday and Saturday. Josh King and the park crew will set it up and MFM and the pro crew are sure to tear it down.